By now, most of you are probably familiar with the current situation in West Virginia in which a chemical leak caused water contamination that affected over 300,000 people. State officials imposed water-use restrictions Thursday 1/9/14 after discovering that about 7,500 gallons of 4-methylcyclohexane methanol, known as MCHM, had leaked out of a storage tank into the Elk River and entered the domestic water system.. Residents were told to use tap water only for flushing toilets, bottled water was to be used to wash hands, brush teeth and take showers. 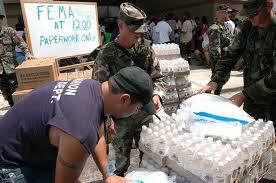 Police, firefighters and National Guard troops have been helping distribute bottled water to residents. The water contamination has affected people in unexpected ways. Many people unable to cook at home went out to go to their favorite restaurant only to find that all the restaurants are closed. Some state officials said that the water crisis may contribute to the spread of flu because people are having a difficult time finding non- contaminated water to wash their hands. Store shelves are empty of bottled water, juices and other liquids. Many residents drank contaminated water before they found out about it. I don’t know if there will be any long-term effects from it. “The chemical 4-methylcyclohexane methanol that was leaked in West Virginia is an organic chemical. This is a relatively unknown chemical that is not on the EPA’s organic chemical list to test for and for this reason we have not specifically tested this organic chemical compound. Therefore, we are unable to positively state that the Berkey system will remove 4-methylcyclohexane methanol. What we do know is that the EPA organic compounds that Berkey has tested for show the lowest removal rate was 86% removal, and that the majority tested greater than 99% removal. However, we reiterate that without specific testing we cannot make any claim of removal of 4-methylcyclohexane methanol. We can only state that the data suggests that the black berkey filters would likely be very efficient at removing the chemical, given that it is an organic chemical/compound. Governor Tomblin’s stated on Twitter 1/13/14 that state officials were working to restore water to the nine counties that were left without water, but he didn’t offer any estimates of when that might happen. This is an interesting situation that proves that you should store water regardless of what surface water is available in your area. I have several good water filters, but I don’t know if they would take this chemical out and make the water safe. In a major disaster who knows, what chemicals could cause water contamination? For this reason, I strongly suggest that you store water regardless of other sources. How much, as much as you can. But remember you need a absolute minimum of one gallon a day per person. Here are some links to information on water storage and filters How to Store Water in a Compact Space, An Inexpensive Water Filter the Bucket Berkey, Sodis an inexpensive method of water purification, Water purification and Filtration one of the Most Important Skills for a Prepper, A Review of the Berkey Water Filters, The AquaRain Water Filter. This entry was posted in water purification and tagged water contamination. Bookmark the permalink.